In the future, photovoltaic facility construction firms besides Siemens will be able to benefit from the layout planning software PVplanet. Siemens offers technical consulting along with the software in order to help customers plan customized and optimally cost-effective photovoltaic facility layouts. Siemens Energy developed PVplanet in cooperation with the Fraunhofer Institute for Industrial Mathematics (ITWM) and Siemens Corporate Technology in order to plan their own photovoltaic facilities more efficiently. Even for installations that only generate a few megawatts, the use of this tool is worthwhile. In a recent example, PVplanet helped to reduce the power generation costs of a planned solar park by six percent. From now on, photovoltaic facility construction firms besides Siemens can benefit from the layout planning software PVplanet. Siemens offers technical consulting along with the software in order to help customers plan customized and optimally cost-effective photovoltaic facility layouts. Siemens Energy developed PVplanet in cooperation with the Fraunhofer Institute for Industrial Mathematics (ITWM) and Siemens Corporate Technology in order to plan their own photovoltaic facilities more efficiently. This planning tool was recently made available to facility construction firms outside the company. Even for installations that only generate a few megawatts, the use of this tool is worthwhile. 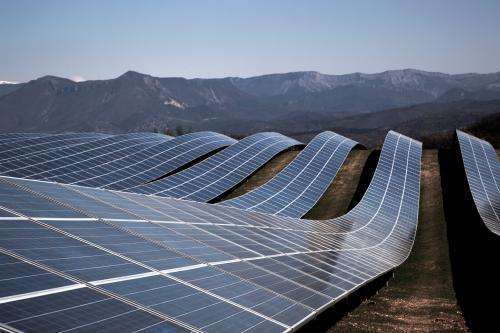 In a recent example, PVplanet helped to reduce the power generation costs of a planned solar park by six percent. Power generation costs are defined as the total cost per kilowatt hour of generated electricity. If this park is built according to the layout designed using PVplanet, it will achieve an additional yield of 350 megawatt hours per year, compared to the original plan. This patented planning tool optimizes the layout of a solar park by taking into consideration a variety of parameters such as location, weather data, distance between the panels, and their angle of inclination, as well as investment costs and anticipated output. The software generates hundreds of layouts for a given facility within a few seconds. The planner can then compare the advantages and disadvantages of each variation and select the best solution. Without this type of assistance, planners would only be able to work out and compare a few layouts (if any) at this level of detail, due to time constraints. Since it was first introduced in 2012, PVplanet has been enhanced with several options. The developers presented a comparison of block planning and individual planning at last year's EU PVSEC photovoltaic conference in Paris. This comparison investigated whether it was more cost-effective to cover a given area with standardized solar panel blocks at a relatively low cost or to use more "fine-grained" and time-consuming planning to take the best possible advantage of a particular site. The dependence of output on the weather is also considered. Probable outputs are an important parameter for calculating the risk inherent in the business model; thus they are part of the basis on which insurers and investors make decisions. PVplanet takes these uncertainties into account at the planning stage and shows the different levels of impact that fluctuations in the weather would have on various layouts. Planners can then, for example, select the layout that offers the most robust earnings or the one that offers the highest earnings potential.